Found in Sabah Borneo in hill and lower montane forests at elevations of 900 to 1500 meters as a small to medium sized, warm to cool growing epiphyte with clustered, erect, simple, fractiflex, slightly constricted at the nodes, leafy carrying distichous, spreading, coriaceous, black hairy on both surfaces, glabrous in maturity, slightly twisted in the middle, sessile, oblong to oblong-elliptic, obtusely unequally bilobed leaves that blooms on several, abbreviated, arising opposite the leaves from the upper nodes of both leafy and leafless canes, .8 to 1.2" [1 to 3 cm] long, glabrous, 1 to 10 flowered inflorescence with linear-lanceolate, acuminate, glabrous above, minutely black hairy beneath floral bracts and carrying waxy, unscented, wide opening flowers. Dendrobium sinsuronense is a higher elevation plant occuring at elevations over 900 meters with flowers with three, less raised longitudinal calli in the center of the lip and whiter flowers. 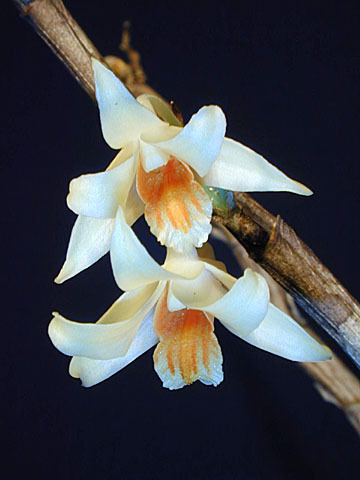 Dendrobium singkawangense has yellowish flowers with 3 prominently raised longitudinal calli and occurs at elevations around 300 to 400 meters.